Before you can use an Analytics Edge add-in, it needs to be registered. In Excel, on the Analytics Edge ribbon bar, click the Register button. Note: the button will change to “License” if the add-in is already registered. 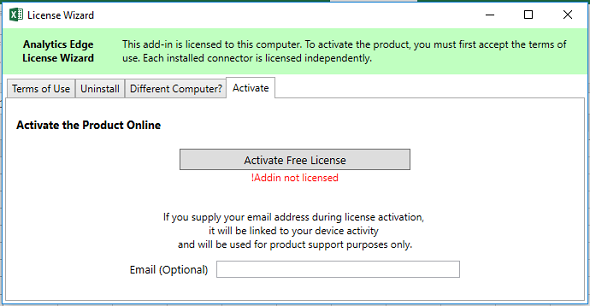 For the free Basic Add-in, simply click the Activate Free License button. To make it easier to request license resets, especially in cases where someone else purchased a license for you, you can enter your email address before you activate the license. Analytics Edge will use your email address only to provide support to you for the product, and it will not be shared with anyone else. To avoid problems with activation, make sure you have a new, empty workbook open in Excel, and a good internet connection. If you get a Server Error message, please try again later in the day. Different Computer error? If your PC has recently had a Microsoft Windows update, first try installing the latest release of the add-in – newer releases are not affected by the changes to Windows itself. Transferring Licenses between computers can only be accomplished by having your purchased license keys reset. Click the Different Computer? tab and follow the instructions. Restarting Excel and/or Your Computer will sometimes help by killing off stalled Excel processes that may be preventing the add-in from initializing properly. This entry was posted in A. E. Basic Add-in on 2018/06/07 by mike_sullivan.